Planning a wedding or a wedding reception is a lot of work and brings up a lot of questions such as “Where can I host it?,” Should we have an outdoor reception?,” “What will we do if it rains?,” “Who provides catering services?” and more. Let The Cow Palace Inn relieve help answer these questions for you and provide some peace of mind. We’ve hosted weddings and receptions on a number of occasions, and are positive we can help you with yours. The first thing you need when planning a reception, aside from the Bride and Groom, is a place to gather. Basked in sunlight and populated with a variety of foliage, our indoor atrium and courtyard provides a spacious area for you and your guests to congregate with ease. We have plenty of space to accommodate large groups of people as well as lodging for any that may be travelling. A typical wedding reception is usually accompanied by refreshments. Depending on the occasion, a breakfast, lunch or dinner might also be part of the festivities. In order to better serve your needs in this time of matrimonial celebration, we provide catering services and have a full, professionally staffed kitchen at your service. Our kitchen and dining area can be found near our indoor atrium, but we can also cater to any of our adjacent convention rooms, which may or may not be necessary to use depending on the number of guests attending. We’re used to serving a lot of food to a lot of people, and are confident in our abilities to host your next party. We can provide you with chairs, tables and even a large, festive pergola (see images below). We have a champagne fountain at your disposal and a bar in the main banquet room for dances. 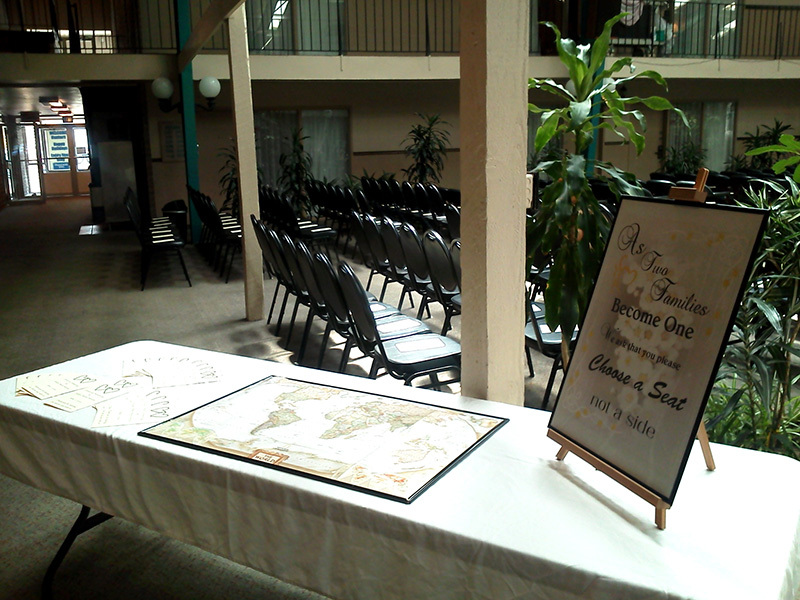 We’ll setup everything for your event, with the exception of the decorations themselves. If you have any questions about our services, please feel free to contact us anytime. If you would like to see our reception center in action, browse through some of our pictures in the photo gallery below.